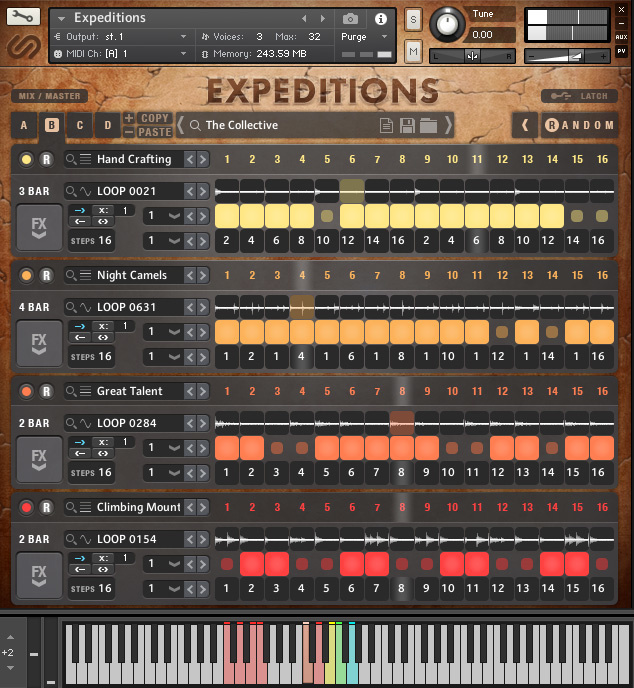 Expeditions is Sample Logic’s latest addition in their loop-based virtual instrument line for Kontakt, a line-up that currently includes the Rhythmology and Electro City titles. It uses the same powerful (and very deep; there is a learning curve here) Kontakt-based front-end that provides loop playback, manipulation, a range of creative effects with sequencing options and is designed to inspire hi-tech music tracks/cues. Given the title — and the ‘Cinematic & World Rhythms’ tag line — I think I was expecting something that was dominated by drums, and perhaps an abundance of traditional orchestral drums or ethnic percussion. While those sorts of elements are most certainly present, and the 2GB of sample content offers all sorts of exotic elements that justify the ‘world’ reference, Expeditions isn’t ‘traditional’. Instead it offers a very modern, contemporary take on ‘cinematic world rhythms’; think music cues for travel shows or globetrotting documentaries and you will be in the right ballpark. In total, nearly 1500 loops form the heart of the library and these are organised into 300 presets, each of which is built around a maximum of four loops. As with Rhythmology and Electro City, the front-end provides various triggering options so, even just using a single preset, you can easily build a 30 to 60 second cue that would slot right in alongside that travel/documentary footage. The library’s browser provides very useful keyword filtering to find presets that might fit your particular mood or style requirements and, even if all you did was pick a preset and play, you could spend a long time with Expeditions before you ran out of inspiration. However, if you really want to capitalise on the content, then you do need to delve into the considerable possibilities offered by the playback engine. This is where the thoroughly modern take on the musical content comes from and, with lots of creative loop-slicing options and almost endless effects options that can be both static and programmed on a step (slice) level, the potential for manipulating the loop content is considerable. You can also save four ‘states’ (SL call them ‘Playback Pages’) of the front-end within each preset so, while your four loops stay the same, each of these states can contain very different loop-slicing and effects sections. Keyswitching then makes it easy to move between these different configurations for additional variety. As with the other titles in the series, Expeditions is most certainly priced for the professional media composer and, ultimately, you are working within the confines of a finite collection of original loops. However, if you can afford the price of entry, this is yet another tool that allows professional-sounding music cues to be created almost too easily. Equally, if you are prepared to dig deeper, Expeditions also provides a substantial creative resource.